Al-Qaida and the Free Syrian Army (FSA) are allies fighting alongside each other for the same cause and should not be viewed differently when it comes to toppling the Assad regime, said Anas al-Abdeh, president of the U.S.-backed National Coalition of Syrian Revolution and Opposition Forces. “They are all in the same trench,” Al-Abdeh told the London-based Arabic newspaper Al-Hayat on May 23. 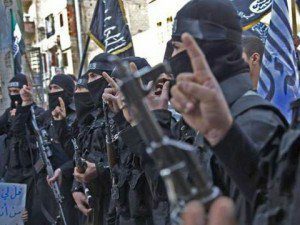 “We cannot differentiate between fighters whether they are Al Nusra, Ahrar Al Sham or the Free Syrian Army,” Al-Abdeh said. Al-Abdeh has had an association with the U.S. government since at least 2009. Classified cables released by Wikileaks show that U.S. taxpayers gave up to $6 million to his former group, the Movement for Justice and Development in Syria, which al-Abdeh founded in 2006. The money funded the Syrian opposition channel Barada TV, headed by his brother, Malek al-Abdeh, and other activities inside Syria. A secret 2009 State Department cable cited a Syrian source who described Movement for Justice and Development in Syria followers as “liberal, moderate Islamists,” including ex-Muslim Brotherhood members. Anas Al-Abdeh opposes the recent American effort to work with his group’s Kurdish rival, the Syrian Democratic Forces, because he and his brother have supported Turkey’s ruling Justice and Development Party (AKP). Turkey represses its Kurdish minority, opposes the idea of a Kurdish state and has used the Syrian conflict to attack Kurdish opposition forces. In an interview with Rudaw on Monday, Al Abdeh criticized the SDF’s recent offensive against Raqqa, ISIS’s capital in Syria, because it is not part of the Syrian Revolution and aligned with Turkey. The U.S. government spent more than $500 million to train and equip the Syrian rebels only led to the training of four or five fighters. Also, American weapons that provided to Al-Abdeh’s group found their way into the hands of pro Al- Qaeda groups in Syria, including Jabhat al-Nusra.